He doesn't play golf ... he destroys it. 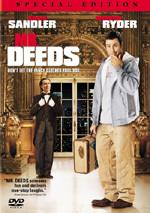 Adam Sandler stars in this hilarious comedy that scores a hole in one for gut-busting and outrageous slapstick. Happy a raucous hockey player turned golfer, sends the sedate sport into overdrive after he becomes a media sensation with his outlandish antics on the links. It's par-for-the-course entertainment co-starring Christopher McDonald, Carl Weathers and Kevin Nealon. Available Only as Part of a Two-Pack with Billy Madison. Although I consider myself to be an Adam Sandler fan, I guess I couldn’t make a strong claim to be a big one since I never saw 1996’s Happy Gilmore. One of the comedian’s more enduring flicks, I can’t recall why I never took in the film. I liked its predecessor, 1995’s Billy Madison, so I can’t conjure why I’d avoid Gilmore. However, I know I skipped a DVD screening of Gilmore because the original release didn’t show the flick in its theatrical aspect ratio. Instead, it presented a fullframe affair, and I didn’t want to support that. That meant I was happy to finally check out Gilmore via this widescreen DVD. The film introduces us to the title character (Sandler), a hockey-obsessed guy with a mean slapshot and a nasty temper. Unfortunately, he can’t do anything well other than whack the puck. He can’t skate or handle the puck, so his tryouts for hockey squads go nowhere. Matters go downhill when his girlfriend Terry (Nancy McClure) leaves him due to his continued failure. In addition, his grandma (Frances Bay) gets tossed out of her home because she failed to pay her taxes. She owes $270,000 and has only 90 days to pay or she’ll lose everything. Happy promises to raise the money. When he gets a challenge to hit a golf ball from the movers who’re taking his grandma’s things, Happy learns he possesses a talent for driving. He swats the hell out of the ball and wins a bet with one of the movers. This inspires him to gamble with local duffers to bring in some cash. Golf pro Chubbs Peterson (Carl Weathers) sees Happy in action and decides to tutor him. We learn that Chubbs was once a rising pro whose career ended when an alligator bit off his hand. Happy resists Chubbs’ offer but agrees so he can raise money. He enters a local contest; its winner will go straight to the pro tour. Despite some rocky moments, Happy wins the tournament, much to the delight of tour PR director Virginia Venit (Julie Bowen). On the other hand, leading tour money-winner Shooter McGavin (Christopher McDonald) seems less excited about his new competition. This shoots Happy right to a tournament event, where he faces off against McGavin and others. Happy ends up in last, but his colorful antics attract an audience. He almost gets bounced from the tour due to his profane rants on the course. However, Venit convinces her boss (Dennis Dugan) to keep him on the tour so she can promote him as a working class hero. From there, the movie follows some basic threads. We see Happy’s attempts to raise money for his grandma as well as the competition that develops with the snotty Shooter. Since Virginia takes the assignment to work with Happy, the pair get to know each other; inevitably, a romance ensues. While Madison showed Sandler’s wilder side, to my surprise, he presents a somewhat more naturalistic turn as Happy. That probably sounds odd given the general wackiness of his behavior, and it’s definitely a stretch to refer to Happy as a believable personality. Nonetheless, he’s a more normal personality than Madison, and the movie takes a more realistic tone. It doesn’t include the surreal qualities of its predecessor. Not that a fair amount of wackiness doesn’t ensue. Probably the movie’s most famous scene, we see Happy face off against Bob Barker in a fight on the golf course. Barker shows a nice ability to make fun of himself and go with the flow in this very amusing sequence. Other support helps the movie. We get the wonderful Joe Flaherty in a pivotal role as a heckler, and McDonald makes McGavin a delightfully hissable but still funny villain. Bowen creates a surprisingly low-key love interest, one who seems much more believable than the ultra-hot Bridgette Wilson in Madison; she’s real and attainable, unlike the fantasy teacher played by Wilson. I like the concept of Happy Gilmore and think it has its moments, but I must admit some disappointment with it. The movie enjoys more than a few amusing elements - I guess I just expected it to be more laugh out loud funny, along the lines with Madison. 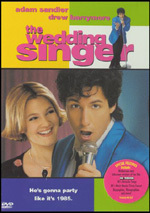 Happy Gilmore appears in an aspect ratio of approximately 1.85:1 on this single-sided, double-layered DVD; the image has been enhanced for 16X9 televisions. I found the movie to present a very satisfying transfer. Sharpness looked fine. A smidgen of softness crept into a few shots, but not enough to really mar the movie. The flick consistently showed good definition and delineation. Jagged edges were no problem, but I saw some shimmering at times plus a little light edge enhancement. Light grain popped up sporadically, and I also noticed a couple of specks and grit, but the majority of the movie looked very clean. Colors worked well and offered some of the transfer’s strongest moments. The film provided a fairly natural but bright palette that translated well here. Bolstered by many outdoor daylight shots, the tones seemed vibrant and distinctive. Black levels also appeared deep and rich, while shadow detail was appropriately opaque but not too thick. I liked this transfer and thought it presented the movie well. For this new version of Happy Gilmore, we found both Dolby Digital 5.1 and DTS 5.1 soundtracks. Don’t expect to hear differences between them, though. When I compared the two, I thought they presented virtually identical audio. As usual for a comedy, not a lot of activity marked the mix. The most exciting moments occurred during the golf sequences. For example, Happy’s drives flew toward the back in a strong manner. Otherwise, the movie mostly stayed with general ambience. It showed a good sense of environment and displayed the material well. Outside of the drives, not much popped up in the surrounds, but they reinforced the action. Audio quality appeared good. Speech was natural and distinct, with no issues related to edginess or intelligibility. Effects sounded clean and accurate, with good fidelity and no signs of distortion. Music seemed nicely bright and vibrant and also demonstrated nice bass response. Overall, the audio worked fine for the movie, but due to its lack of atmospheric ambition, I felt it merited only a “B”. Only a couple of extras show up for this new version of Gilmore. The main attraction comes from a collection of 26 deleted scenes. These last a total of 20 minutes and eight seconds and consist mostly of small excised tidbits. We get a little more exposition and a couple of fairly substantial scenes appear. In one, we see Happy try unsuccessfully to fire his caddy, and another shows Gilmore on a date with Virginia. Some of the clips probably should have stayed in the film. For one, we actually get a payoff for the Ben Stiller character; he never receives his comeuppance in the theatrical version. A couple of the expository pieces also allow the tale to make a little more sense. All in all, we get a nice set of scenes. We also find a five-minute and six-second set of outtakes. The Madison package included some interesting elements in its blooper reel, but this one’s just the standard silliness. The text production notes add some basics about the flick; they don’t tell us much. A few ads pop up at the start of the disc. We get promos for the Fast Times/Dazed and Confused “Ultimate Party Collection” set plus The Chronicles of Riddick and The Bourne Supremacy. I don’t think Happy Gilmore stands as Adam Sandler’s best flick, but it presents more than a few good moments. It enjoys a cool concept and some amusing gags to become generally likable, though not exceptional. The DVD features very good picture with more than adequate audio. Unfortunately, it skimps on extras, though we do find a generous assortment of deleted scenes. Gilmore doesn’t threaten to become a classic, but it remains an enjoyable flick.